Kumara Parvatha Trek Descent -2 : Bhattaru Mane to Kukke ~ The Wandering Soul's Wander Tales..
Next morning we hit the trail again by around 8 AM. Now the task of getting down the hill was becoming more tedious as we also had our luggage to carry while we tried to balance ourselves. We slipped, we fell, but we made it to Kukke Subramanya in one piece by 12-1 PM! We met a couple of childern playing cricket at the foot and joined them for a game. We were back in the same hotel where we started this wonderful sojourn - two momentous and joyous days in the woods. We were planning to eat at the Subramanya temple which is known to serve the tastiest food but it was too crowded and we had to start soon for B'lore. Instead we thought we would atleast visit the temple but people were queued up already in long lines and no chance of that either. But miraculously one gate in front of us was opened( I don't know for what reason) we pushed our way through to have a wonderful Darshan. And as always all's well that ends well! So was the end of this journey. 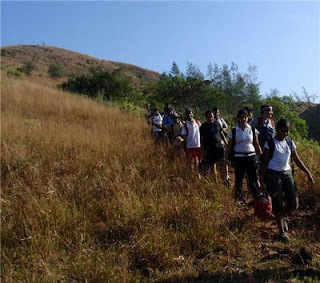 We have updated our home page with Photo and description of your trip to Kumara Parvata. The photo and contents are taken from your blog and a link to the blog have been provided at the end. "Stop littering and save environment"